I have a Bachelor's degree in Two Dimensional Art. I have a minor in English and a certificate in Canadian Studies. I have worked in Commercial Property Insurance for the past 10 years. LOL!!!! You know I already did this. I'm typing this on my MacBook Pro, with my iPhone next to me. I have three iPods (80gb, 160gb and a 2gb Shuffle), My dad got a Mac Plus in 1987, I got my first computer (a hand-me-down SE) in 1990...I think? and I've had one ever since. My first Powerbook was another hand-me-down from my dad in 1998. Everytime I get a new Mac, I'm amazed at how much it improved over the last one...and I thought the last one was pretty damn amazing. And every machine he made is just so...cool, too. He was the first guy tho realise tech didn't have to be ugly. The feeling you get when you get a new Mac toy...when you open the box (also exquisitely designed)...it's like Indiana Jones opening the Ark. You expect a light to shine up from within and an "ah-ah-ahhhh!" song to start. He should have had 30 more years to make us cool stuff dammit. PS: How damn awesome is this photo!? Dan Shaughnessy, this is all. YOUR. Fault. Oh, right. Tampa will never come back from a 7-0 deficit. Yep. NEVER. I never Tweet, but I did last night. It's no longer "The Curse of the Bambino." Now, it's "The Curse of @Dan_Shaughnessy." See!? I'm not the only one who thinks so! You can see it for yourself, right here! And also, HA!!!! Red Sox have Dan Shaughnessy to Blame. However: "You could point a finger at every guy in this locker room -- maybe not Jacoby [Ellsbury], he pretty much did everything he could -- but every guy in this locker room could have won one more game for us. I could have won a few more, I know that for a fact. It's a team game, and we had a lot of stuff go wrong for whatever reason." Ever, I'm going to have to go with The Twilight Zone. The fact that they're still interesting 50 years later says a hell of a lot. Currently...? Hm. A year or so ago, I'd have said Lost. Now..? Tough call. Probably my favourite new show is Law & Order UK. I'm really in love with it, and dying to see the next episode tomorrow (OMG). It also captivates me because it's old original Law & Order eps from 10+ years ago (mainly, the awesome Lenny years), updated to the 21st century and transferred from NYC to London. Even the most classic eps, like the one where Rey takes the woman whose baby has gone missing back through her day to retrace her steps and it ends up she put the child in a furnace so it could be in heaven...they're just different and fresh. And, okay, yeah, I love playing the "how long does it take to identify the episode" game. A lot. 2 years, 1 month, 27 days. "Well, that explains a hell of a lot." I'm selling posters of Maneki Jakeo to help raise funs to help cats and their humans in Japan. $10 of each sale will go to Japan Earthquake Animal Support. 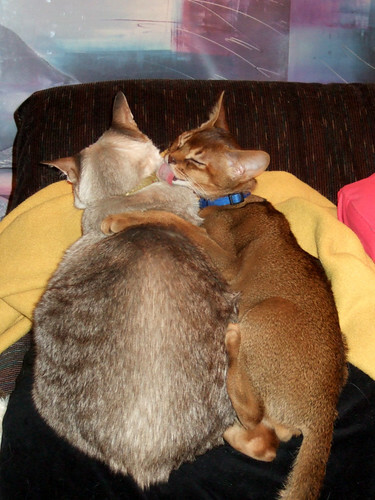 More details in the Daily Abyssinian blog. They may require a donation for votes...It wasn't presented that way, but I may have missed that part on the rules page. If so, don't sweat it. Look at me. 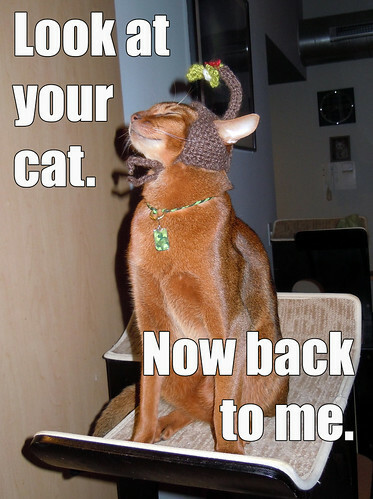 Now look at your cat. Now back to me, then back at your cat, and now back to me. 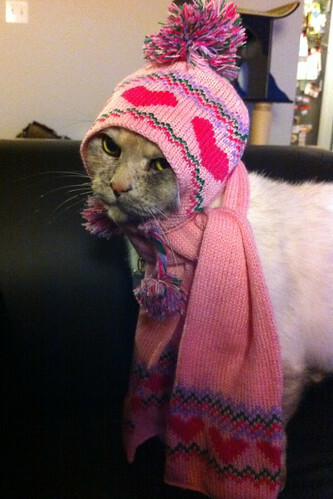 I'm what your cat could look like if you could put silly hats on him without risking losing several pints of blood. Sad news...Patrick was put to sleep today. He had lost half his body weight (and he did not have hypothryroid), his kidneys were failing, he was severely dehydrated and he could not maintain his body temperature (his temp at the vet was 94° - normal for a cat is 101.5°). He also had a dark area on his lungs in an X-ray, and there may have been other things going on as well, but they stopped running tests on him. My mom will send me his ashes, when they come, as well as his paperwork and his collar. I'd just sent him one of his original toys that came with him when I adopted him for his birthday...It's hard to be sad when he had such a long life, and he was fairly healthy until just this past week, so he didn't suffer at all. I am just so happy that we went to see him this year. We went to see him as much as my mom, and we actually lay down on the floor next to his slumber ball and napped with him...seemed kind of silly at the time to nap with a cat...but it was nice. I am thinking to get him an urn like this one, only with a stripey tail, to go along with Harri's urn. He was so happy at my mom's house, with its wall-to-wall carpeting, its huge sliding-glass door/window through which he could watch the scrub jays, mockingbirds and squirrels in the large backyard, its gas fireplace, it's hallway, it's garage that he liked to play in, and its tall cat tree next to more windows to look out of from on high. Taking him out there was the best thing for him. 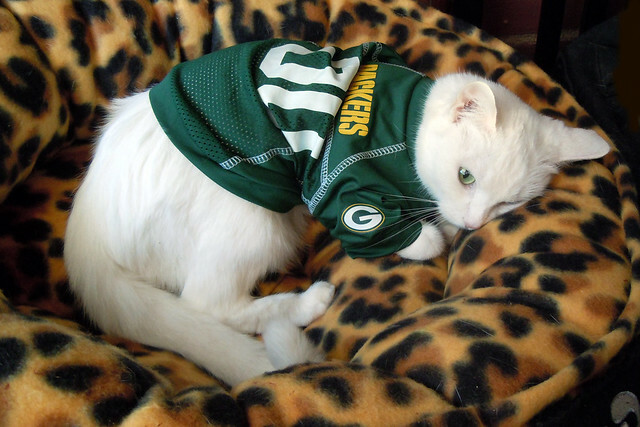 My heart has joined the Thousand, for my friend stopped running today...He hunts with StarClan now. Well, that figures. I go to San Francisco, and Boston has an earthquake. This just...ARRRRRGH!!! I've been to Newport. Dave lived there for 15 years. It's like Carmel, all fancy houses and rich people, which makes this all the more disgusting. 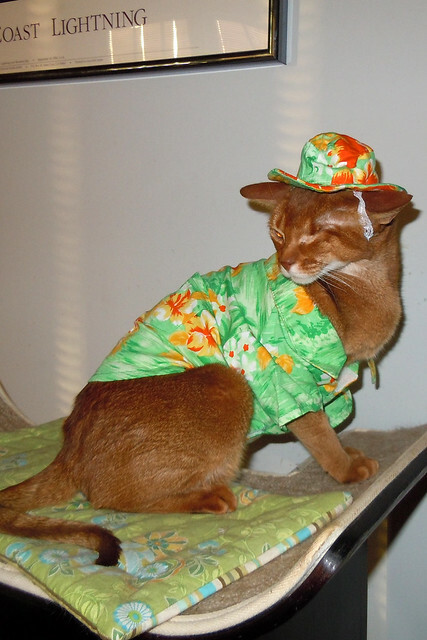 And it's Abyssinians. Any other type of cat would be bad enough, but Abys? I just imagine 48 Angels. 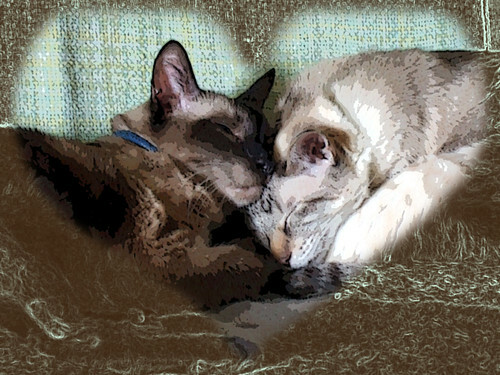 "I thought you would be interested to know that the Potter League for Animals removed 48 Abyssinians from a cat breeder in Newport, Chickwick Abyssinians, from her house. They also removed a corn snake, one dog, a turtle and two other household cats. She now has no animals. This situation was discovered because there was a fire in her home and when the fire department came they discovered such filth that all these cats were living in. I I looked at her website and it is a pretty nice website, you would NEVER think that she had terribly sick cats and kittens. The Potter League has most of them presently, they have other rescue groups coming in and believe it or not only one had to be put to sleep because its eye was not in the head and one did die at The Potter League. According to one woman from Potter's she is a greedy woman and only cares about selling her kittens. She lives on one of the most beautiful locations in Newport, you would never think this woman would live in these conditions." Tell all your friends. 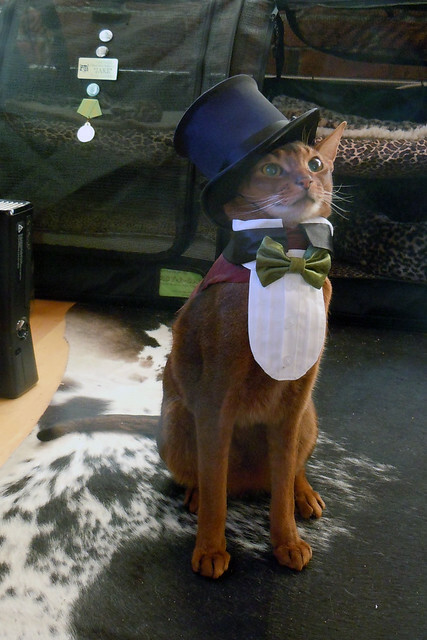 Especially if they've ever wanted an Abyssinian. Home waiting for the HVAC guy (he actually just showed up) to do our annual service, so it's my day to post videos. This is awesome (and I must thank cahwyguy for this): A filmed trip down Market from 8th Street (across from Hyde) to the Ferry Building in late 1905 (just months before the Great Earthquake and Fire). As is well known, cats hate George Bush. Now they have another good reason: The proposed George W. Bush Library will evict a feral cat colony. It's missing Don Piano, but...it's still awesome. Edit 1: Oh, Hurley. You broke what was left of my heart. Edit 2: Angry Asian Man shares my pain. As you all know, I love Jorge Garcia's blog. I love that, despite being an actor on an incredibly popular TV show, he's a dork like the rest of us. He posts about cooking, gardening, his vacations, his (very awesome) halloween pumpkin carvings, and his dog Nunu. He illustrates most of his posts with photos, which just makes them all the more awesome. So, if you saw the Hurleycentric episode "Everybody Loves Hugo" on Tuesday, you may have noticed that, during Dr. Chang's slideshow, there was a shot of Hugo Reyes, humanitarian and philanthropist, holding a dog outside the Hawaiian Humane Society. Well, guess what? That was, indeed, Jorge's own dog, Nunu. I mean, how awesome is that, getting to have your pet appear in an episode of Lost? I can't believe I haven't posted these yet! 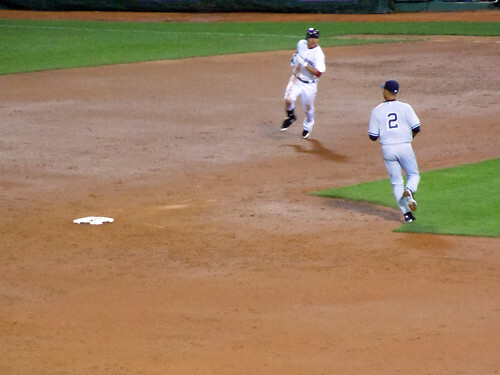 Photos taken with my new Nikon S8000 from the CVS Family Section in left field, section 32, row 7, seat 12. Since it was cold and rainy this morning (yay, April in New England! ), I took the T into work. It's a pretty fun trip since we moved to our new office; Aquarium Station has an entrance inside our building, but the Blue Line is the least convenient line to access from the Red Line. I have to go two stops on Red, change to Orange, go one stop, change to Blue, go one stop, and I'm at work. 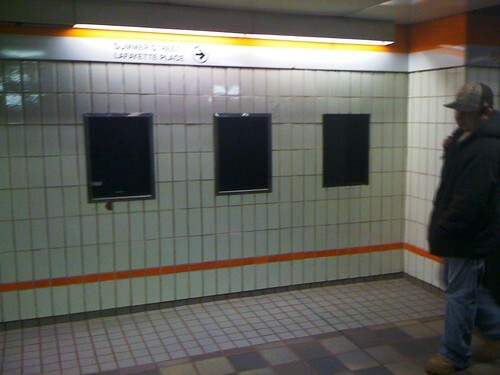 However, I saw this in Downtown Crossing while changing from Red to Orange, and it cracked me up. Remember payphones? There used to be a bank of them set into the tiled wall here on the Oak Grove platform. 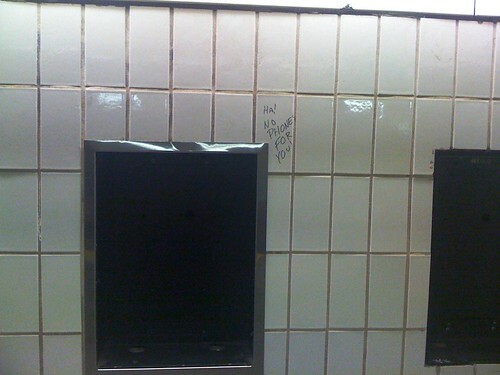 Someone had written something in black Sharpie next to one of the empty payphone holes. Ha! 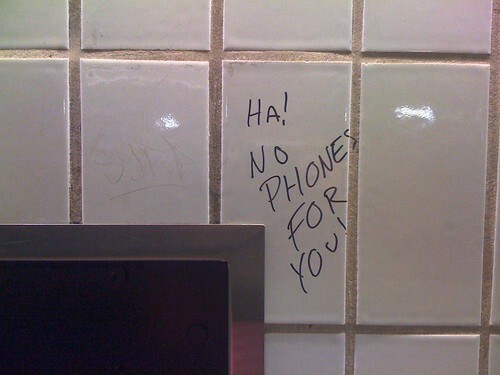 No phones for you! I had to use my iPhone for these photos because it was handy. Not bad photos, though, all things considered. Speaking of iPhones, there's a new app ad on TV lately (I assume this is a national commercial, since I've only seen it during network broadcasts) that talks about a guy's morning commute where he misses his train. Well, the graphics of app he uses to find out when the next one is coming looked...familiar. So I went to the App Store and did a little digging, and sure enough: It's called Mass Transit, and it's a guide to the T (trains and buses), Commuter Rail, and Water Taxi. And it's no wonder: the company that created the app is based in Cambridge. Granted, it's silly to look up when the next Red Line train is coming at Downtown Crossing during the morning rush hour, but still...kind of awesome to see. And I totally bought the app, too - since Dave's started taking the Commuter Rail to work, I've been riding it once every couple of weeks to meet him after work. I remade this. Much better with Impact. I also found two screencaps I liked better than the original. Design your own fabric print at Spoonflower.com. I don't even sew, but OMFG, I have to make some damn fabric! OMG. I was crying laughing at this. Comedy GOLD. But the best part? It's actually just after the LOLcat part! Colbert: "So, what do you think the difference is between a Left Wing blog and a Right Wing blog?"